+ Make sign of cross** on pet's forehead. for the rest of your life. Amen. 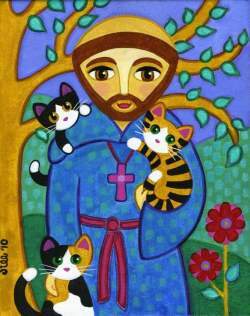 * Of course, there are a gajillion (technical term) Franciscan pet blessings out there, and most are better. Mine simply has the distinction of bein' short and therefore easier to remember. ** I like to dip my thumb in holy water and then trace the sign of the cross.